An expedition to Ama Dablam is more than just a climb. It’s a journey into the heart of the Himalayas. Located in the Khumbu valley of Nepal, only 12 km from the summit of Mount Everest, Ama Dablam demands the attention of every passer-by. Soaring ridgelines and super-steep faces guard the summit from all but the experienced climber. From the summit you are surrounded by a vista of peaks like no other, five of the highest six peaks in the world are clearly visible. Our ascent will be made via the conventional SW ridge route, a technical route that requires 3500m of fixed ropes and four camps above base camp. The climb can often be completed easily in less than four weeks; however, we do build in an extra week in case of exceptionally bad weather. The climbing on the route involves pure rock climbing on exquisite granite followed by mixed snow and rock climbing. The last section to the summit involves ice climbing followed by a long steep snow slope: often ropes are employed all the way to the summit. The reasons for this are three-fold: safety, speed, and success. Due to the technical nature of the route, ropes will be fixed for most of the climb above camp one. Although we can brush-up your skills at base camp, a good working knowledge of abseiling and use of mechanical ascenders (jumars) is mandatory: prior experience is required. This might involve a couple of weekend sessions at your local cliff or bridge. Camp II: 6000 m, situated on top of the Yellow Tower on a narrow platform this campsite is rather exposed and has fantastic views. If you dropped your cup from here it would probably land in base camp! Summit day: The initial route is to the right of the huge "Dablam" (ice cliff), up against a moderately steep slope, which is often iced. DAY 01: Upon arrival in Kathmandu, you’ll be met by the trip leader outside the customs and immigration area and transfer you to your hotel. The afternoon is free to relax or explore on your own. Day hike to Syangboche (3900 m) for breathtaking all-round views of the Himalayan giants. After you have had your fill of the snow peaks, hike on to the Sherpa countryside villages of Khumjung and Khundu. Short walk to Pangbouche. Afternoon receive blessing from head Lama & relax. Submission of application for climbing permit & coordination with Ministry of Tourism. Ministry Briefing/de-briefing in the Ministry of tourism. Plenty of re-hydration drink like tang juice, soups etc. A climbing permit is required to climb peaks, which are above 6000 meters (Six Thousand meters). Loben Expeditions has details of all peaks and rules and regulations regarding climbing. The first step towards your expedition is applying for a climbing permit. An application can be submitted to Ministry of Tourism, Mountaineering section in Kathmandu. In case you face any difficulties to fill any item on the application form, just leave it we will complete in accordance with rules. We will take care of your application and will keep you updated with the process for which we do not charge any to our valued clients. The application form (ANNEXURE “A”) and the other form that contains information about leader and members (ANNEXURE-B) can be sent to you on request. You can re-send the filled application by e-mail as an attached document to loben@lobenexpeditions.com. The necessary clearance takes about 15 days to be cleared from all the concerned authorities. Our expedition department follows up the application until the issuance of the permit from the Ministry of Tourism. Visa is required for all nationalities for entering both Nepal. The visa for Nepal can be obtained on arrival at Kathmandu International airport, visa fee US $ 30 for a single entry. One can also pre-issue from your country Nepalese Embassy or Consulate. You will be staying in Nepal for about 65 days thus visa should be valid till you depart the country. There will be BC Manager, Cooks, and Kitchen boys to handle base camp. On the way to base camp in and out we will use our regular tea house with all meal ( Breakfast, lunch, and dinner). Single room supplement charge is applicable to the lodge (normally USD 10 per night) and cost of other charges like mineral water, soft drink is payable by the client directly. 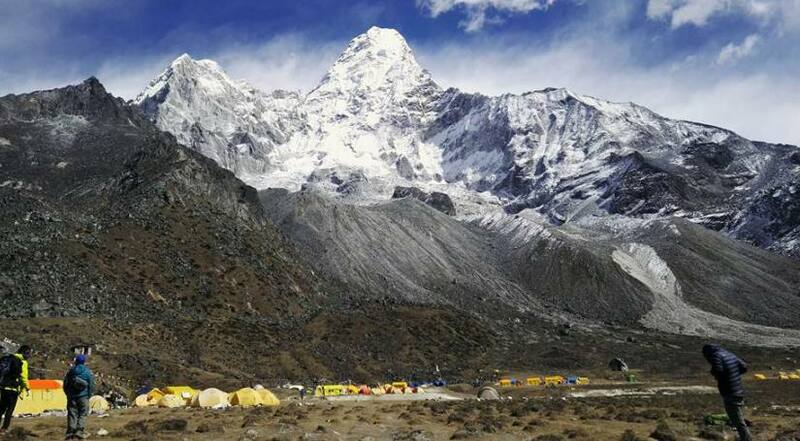 Our Amadablam expedition provides dome tent single occupancy at BC with one form mattress. There are no single supplementary charges for a tent. Dining tent will have to share with team members, besides there will be kitchen tent with a complete set of cookery & cutlery, toilet tent will be pitch bit more than 50 m away from a camp area. There will be shower facilities at the base camp. All meals are included except at during our stay in Kathmandu. Three meals a day with at least 5 courses will be served hot at BC & ABC with a supplementary item like biscuits, chocolates, various hot drinks, juice, chocolates bars & cereals. Most of the food item will be western oriented with local staples such as rice, vegetables etc. Fresh vegetables & meat will be supplied whenever available or possible. The menu of food will be managed by our BC cook. However, a team member can discuss a day menu with cook before preparation every morning or evening. For re-charging any kind of electronic device (digital camera, video camera, sat phone etc) there is electricity in Lukla, & Namche. At base camp, we use 12 V batteries, which are constantly charged by the solar panel. We also take AC invertors to get AC current flow with a multi-plugin. Just make sure you have 220 V adapters for AC current or you can get 12 V DC from a battery to recharge your devices. Be prepared for a wide range of temperatures - from freezing nights to snow and wind, to bright sunshine intensified by the high altitude. This wide fluctuation in temperatures makes it important to bring everything on the equipment list.